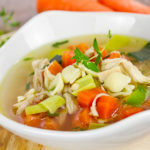 Healthy and Delicious Chicken Soup Recipe - Ready In Minutes! Instant Pot Chicken Soup Recipe – So easy, yet so amazingly delicious. The Instant Pot has made life so much easier and our food taste so delicious. Recipes that typically take hours to prepare in a slow cooker, stovetop or oven can be made in minutes but still have that cooked all day taste. 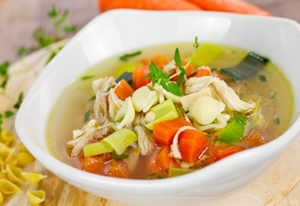 Healthy and Delicious Chicken Soup – warming to your soul! With just a few basic ingredients this soup will be on your table in less than 30 minutes! It is the perfect soup to warm your body and it will even make you feel better when you have a cold. Why do you think Mom always made you chicken soup when you were sick? If you like life a little on the spicy side, feel free to add in diced jalapeno peppers a few red pepper flakes. If you are more of a traditionalist and prefer to have chicken and noodle soup you can easily add the noodles in at the end of the recipe. After the soup has cooked and you are shredding your chicken breasts, place your Instant Pot on Saute and boil the noodles for approximately 6-8 minutes or until tender. We also make our own chicken stock in the Instant Pot. Add chicken bones, vegetables, salt, pepper and a bay leaf to your pot. Cover the bones and veggies with water and cook on manual pressure for 90 minutes. Strain and refrigerate or freeze broth until ready to use. That’s all there is to it! So when you are feeling a little sick, or are tired of the cold weather and need something to warm you up, give this quick and easy soup recipe a try! Close and lock the lid. Press Manual for High pressure for 12 minutes. ← Herb Roasted Potatoes – Ready in Just 20 Minutes! I made this last week when I was feeling a little sick. It was so easy, and tasted great. I added a little garlic too. When I took the chicken out to shred, I added some fresh (refrigerated) pasta, and cooked on manual for 0 mins. then did a quick release. Voila, chicken noodle soup! So glad you liked it and I hope you are feeling better!